Environmental Protection Agency or Environmental Destruction Agency? Since President Donald Trump took office, the Environmental Protection Agency (EPA) has seen an exodus of nearly 1,600 former federal employees, including some who say they “did not want to any longer be any part of this administration’s nonsense” and believed they “could do better work” elsewhere, according to a new report from the Washington Post. “I felt it was time to leave given the irresponsible, ongoing diminishment of agency resources, which has recklessly endangered our ability to execute our responsibilities as public servants,” Ann Williamson, a scientist and longtime supervisor in the EPA’s Region 10 Seattle office, who left in March after 33 years, told the Post. 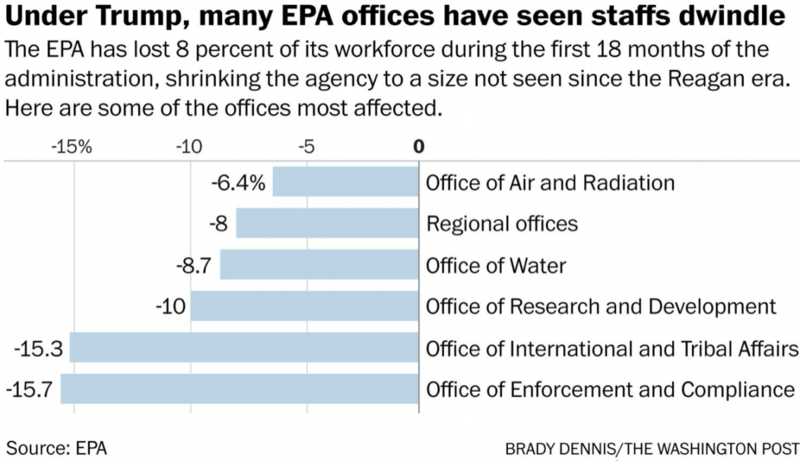 During the president’s first 18 months in office, the EPA has hired fewer than 400 new employees. With limited hiring and a flood of departures, the agency’s workforce has declined by 8 percent—or, as the Post noted, “to levels not seen since the Reagan administration, which has always been the administration’s vision for the agency.